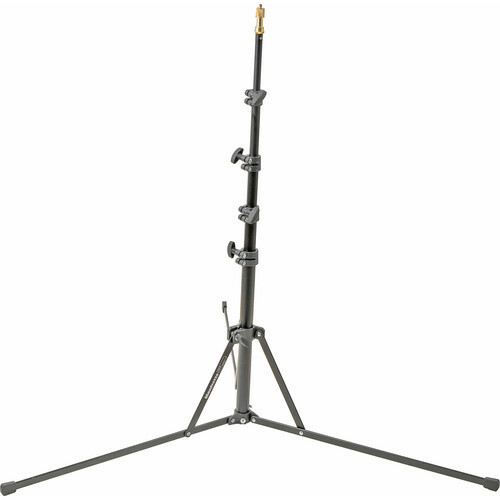 5001B Nano Black Light Stand - 6.2' (1.9m) is rated 4.7 out of 5 by 295. Rated 5 out of 5 by Ricardo B. from Must Have for Strobist Light Bag I now own three (3) of these stands - one for every Canon SpeedLite I own, and they are a MUST HAVE for the strobist arsenal. They are lightweight, close to a compact size, are well built, and sturdy. I highly recommend them for portable speedlite type flashes. Be sure to add an Impact Umbrella Adapter (B&H Part# IMBSM) to your shopping cart for each stand you purchase. Note: If shooting with Nikon flashes, you will also need the Stroboframe Shoe (B&H Part# STAS) to attach to the Umbrella adapter unless you are using a FlashZebra type hotshoe - which I use for my Canon flashes to connect to a remote radio trigger. Rated 3 out of 5 by LOU from Returned mine David Hobby and Bob Krist fervently endorse this compact - but flimsy - light stand; sorry, but I can't. The basic assets of portability and compactness frustratingly overridden by jello-like stability during adjustments, which means waiting... and waiting for the tensile wavering to subside before you can continue shooting. Why make that sort of compromise, unless excessive girth the ONLY concern? If you barely touch your lights, or don't extend much beyond the middle range of the stand's maximum height, go for it. It's still decently constructed, with good mechanicals, but too petite to inspire much expectation at taller extension, at least with an umbrella on board. Strobe-only use may be acceptable to most. Rated 5 out of 5 by Dan at VigorOtaku from Durable, Portable, reliable I use the 5001B Nano Black Light Stand - 6.2' (1.9m) by Manfrotto daily as my portable go to light stand. I use it with a Lastolite TriFlash Bracket and umbrella or a Lastolite Hot Shoe EZYBOX Softbox - 24x24 (61x61cm). I carry 3 umbrellas, 3 TriFlash Brackets, and 6 flashes around with me on sites. Sure I would love to have more, but I have been able to light everything from a small toy to a warehouse with my little backpack of lights. This is the best portable light stand on the market. Remember, you need to weight these things down when you put umbrellas, etc. on them. Rated 5 out of 5 by HarleyHuffman from Great stability on the go! The Manfrotto name has always stood for time tested precision and quality. This light stand is no exception. From the moment you take it out of the box you can feel the quality and instantly know that you made the right choice. Light stands aren't in the optical chain so it's easy to skimp and buy a cheap off brand to save some money. But if you live in the real world then you know that saving a few dollars now can cost you big in the long run... I've had several different light stands in all different price ranges over the years and this is my favorite. Two of these come with me on every shoot and I am still very happy with them. Rated 5 out of 5 by Alex from Lightweight, portable and does the job Thus far I have used this around the house in makeshift studio setting. I bought it for the compactness for travel and location shoots, but find the small size nice for storage at home as well. Sets up and tears down quick with nice knobs. Max height is enough for me, but at that height, you're pushing the weight limit with just umbrella, adapter and speedlight. Adding bags helps though. No real complaints, just what I was looking for in a portable, lightweight stand. Used with Wescott 43 double fold, Manfrotto 026 swivel adapter, Canon 550EX, Flash Zebra sync cable. Rated 5 out of 5 by KRad from You couldn't pry it out my gearbag! I got one of these nano stands over a year ago when I started doing more destination wedding coverage. It actually even fits in my carry-on luggage! As a petite gal, I just found it impossible to lug full-sized gear everywhere and I'm not ready to sacrifice beautiful off-camera lighting for my clients, so the Nano has been an elegant portable solution. Now you couldn't pry it out of my cold dead hands... or gear bag. I just bought two more last week and plan on adding another shortly so my husband can stock his bag with them too. Rated 5 out of 5 by Hoan from Sturdier than it look I bought this light stand so I can take it on a plane to go a friend wedding. I am use to 9-10 ft heavy duty stand so I wasn't sure if I would like this smaller/lighter stand but I do need something that fit into my carry on bag with no issue. Yes, this is not a heavy duty stand that you can put 3 flashes/large umbrella on it and expect it to stand up to hurricane force. But if you want to put a small flash on it for indoor work, the wide and low base of the stand make it pretty sturdy and unobtrusive to passerby. It is a little pricy compare to a normal stand but I'm really loving its compactness. Even when I don't fly,I love how I can just stick this onto my bag and be on my way. Rated 4 out of 5 by Dsone from Great Compact Stand I bought this stand because of its compactness and lightness. The stand is great for on-location work when space is a premium and/or need a stand with smaller footprint. It is also fairly effective as a boom as an assistant can easily hold it because it is lightweight. Because it is so light and compact, don't expect to load with heavy lighting equipment or accessories. Also, be aware that the stand is NOT air-cushioned, so when loosening sections they could slam down. The legs fold backwards making this lightweight stand quite small when broken down. what is the origin county? According to our records, the country of origin for this stand is Italy. I lost one of the knobs. Where can I get a replacement? Or what should I ask for when looking? You may contact Manfrotto directly for this part at 1-201-818-9500. How long is this stand when folded? I am looking for something that will fit in my carry on. Folded it is 19 3/8 , or 49cm.including the spigot. Can you recommend a compact bag or case for this stand? Even if not something to be carried on its own but just to prevent rubbing it against other items in a bigger enclosure. There are many cases that will work for that stand.I will list some options. How much extends the legs when open? (What would be the radius of the circle they define), need to be sure if I can use in a small space. I also never put them flat to the ground like in the pic, you'll have plenty of room to use in a small space. They don't have to go wide and flat. the largest radius circle is 20&quot; as shown in the picture, but the way the legs extend the smallest it gets is 8&quot;. However, it may be a bit too unstable in a high traffic area at this extension. Can I mount my alien bees b400? I mount speedlights to it and it works great. However, with the weight of the Alien Bees, you may want to just make sure you have a sand bag on it or something to keep it down.